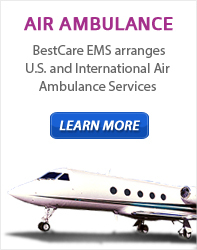 BestCare EMS – Ambulance & Air | How is Non-Emergency vs. Emergency Transport determined? Place the patient’s health in serious jeopardy. Cause serious impairment to bodily functions. Cause serious dysfunction of any bodily organ or part. BestCare responds immediately at the Basic Life Support (BLS) or Advanced Life Support 1 (ALS1) level of service to a 911 call or the equivalent in areas without a 911 call system. An immediate response is one in which the ambulance supplier/provider begins as quickly as possible to take the steps necessary to respond to the call. Non-emergency ambulance services may be those that are scheduled in advance (scheduled services being either repetitive or non-repeating. Medical necessity is established for non-emergency ambulance services when the patient’s condition is such that the use of any other method of transportation (such as taxi, private care, wheelchair van or other type of vehicle) would endanger the patient’s health. Insurance may cover non-emergency ambulance transportation if the beneficiary is bed-confined or if the patient’s medical condition is such that transportation by ambulance is medically required whether or not the patient is bed-confined. Transport to nursing home or patient’s residence. Transport to and from medical treatments, appointments or End Stage Renal Disease (ESRD) facilities for scheduled dialysis.